Acupuncture is a therapeutic method of treating painful disorders,both acute and chronic, of the musculoskeletal system using insertion of fine needles into the skin and tissues of the body at specific points. Acupuncture stimulates the body to produce it's own pain relieving chemicals called “endorphins”, helping to improve and stimulate the body's natural healing abilities, reduce inflammation and promote physical and emotional well being. Most clients find the treatment causes minimal discomfort, and is relaxing. 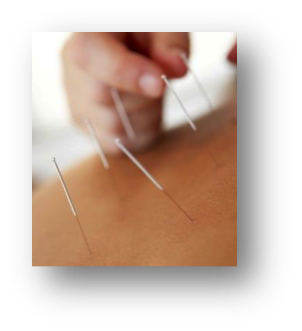 Western medicine believes that acupuncture can have an effect on pain relief. Acupuncture points are believed to stimulate the central nervous system (the brain and spinal cord) to release chemicals into the muscles, spinal cord and brain. These chemicals either change the experience of pain or release other chemicals, such as hormones, that influence the body's self-regulating systems. The biochemical changes may stimulate the body's natural healing abilities and promote physical and emotional well-being.